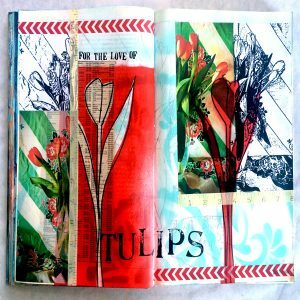 Project Description: Mixed Media Art Journaling is more than a sketchbook; it’s a way to experiment with techniques, materials, explore visual ideas and themes. 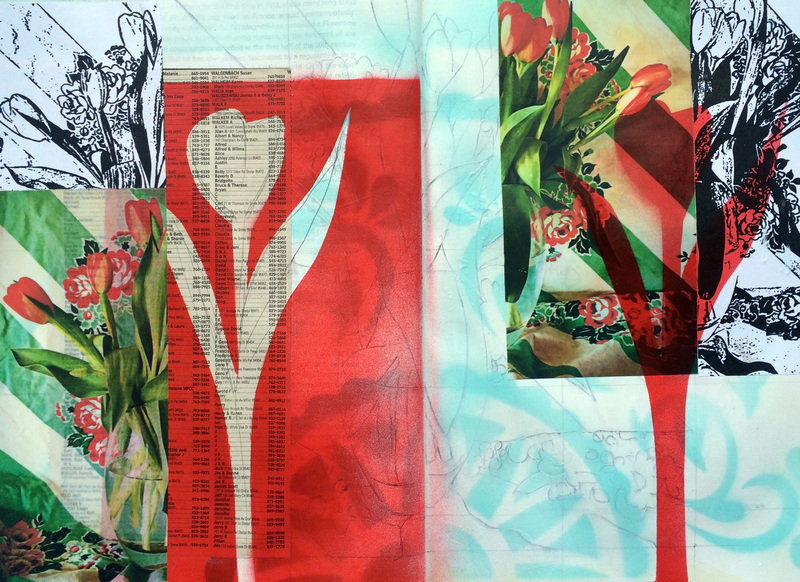 All bound in a wonderful portable record of a mixed media journey. 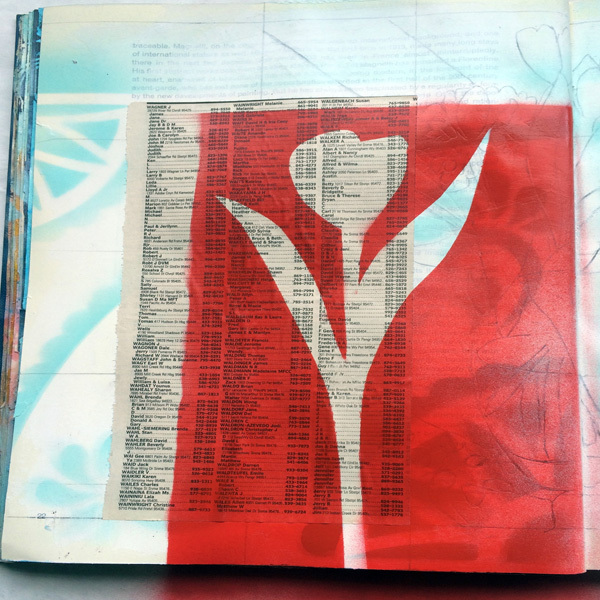 Use an old art textbook with the pages lightly gessoed so the words just barely show or a traditional mixed media art journal. Using the latter has thicker pages that can stand wet and dry mediums. 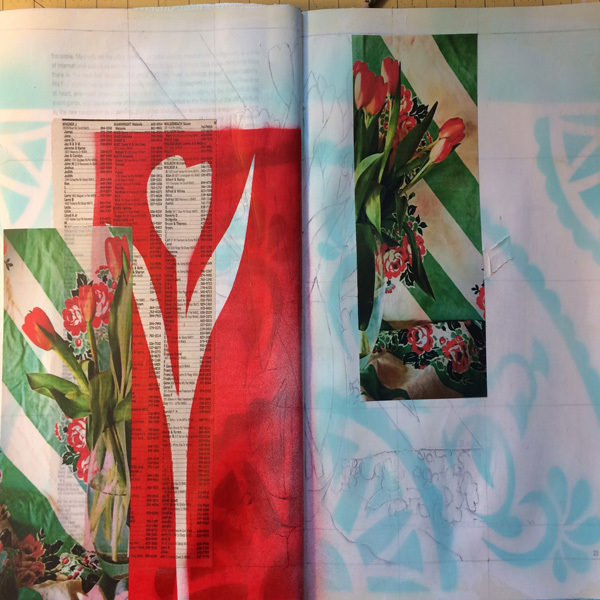 This journal page uses a photo of tulips printed on Computer Grafix and a black and white copy on paper of the same image. 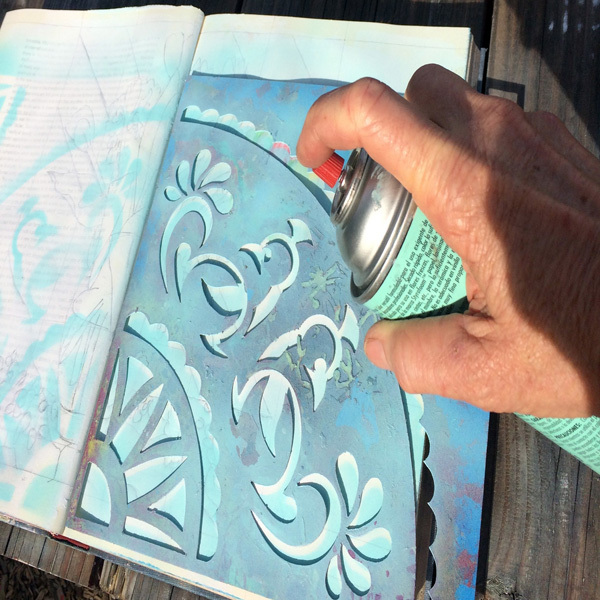 Start by spray-painting the journal pages with a light dusting in pale blue. Tip: When using spray paint always work outside or in a well ventilated space. 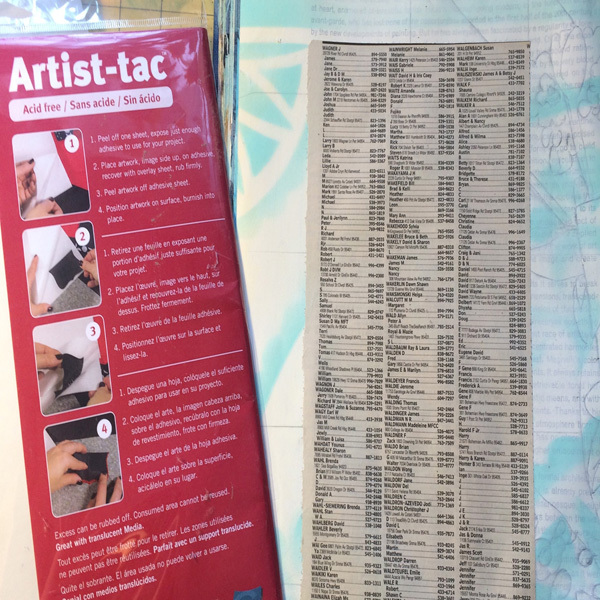 Add more interest to the pages by adhering a phone book page to the left side using Artist-tac adhesive. This product creates a strong bond even over the gesso and spray paint. 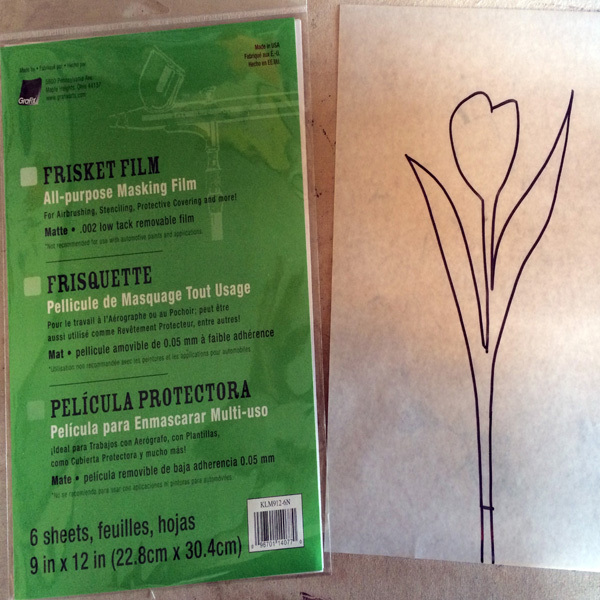 Create a silhouette of a tulip by drawing on Grafix Frisket Film with permanent marker and cut it out with scissors (make sure you save both the negative and positive images to use). Lightly tack down the Frisket tulip over the phone book paper and sprayed with red paint then gently remove the Frisket mask. Cut printed image of tulips on Computer Grafix in half, remove backing and gently press one half to each page. Using Artist-tac adhere portions of the black and white photocopy to provide contrast. 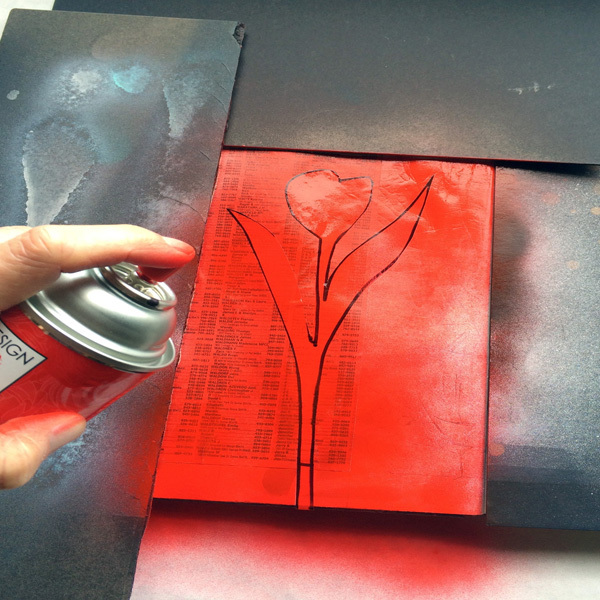 To bring more of the red to the right hand page use the outside of the tulip mask cut from the Frisket Film to spray paint a red tulip on the right — creating a negative and positive of the image. Finally add some rubber stamped words, outline stenciled images and a bit of washi tape embellishment.